Thank you for your interest in taking part in this year's Wallingford Carnival. To book a stall please click on the link below to download a Booking Form as a PDF. The fees and arrangements have changed from previous years. Stalls located in the Market Place will attract a higher fee than those in other places. 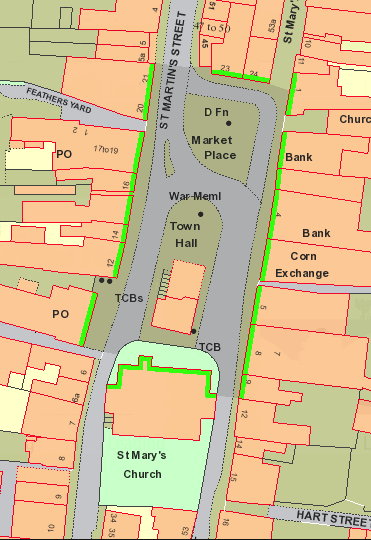 The Market Place is highlighted on the adjoining map. Hot Food Stalls - separate arrangements apply, please contact the Stall Co-ordinator. If you need more than a single 3m x 3m space please discuss your requirements with the Stall Co-ordinator. The Theme of this year's carnival is "Tell Me a Story" and stallholders are invited to decorate their stalls (and themselves!) in line with this theme. The roads will be closed to normal traffic from 9:00am to 8:00pm. On Carnival day, stallholders can start to set up their stall before 9:00am, but the roads must be kept clear until 9:30am. Stallholders are responsible for clearing away their own litter. All stallholders are expected to have their own public liability insurance and be able to demonstrate compliance with any other legal requirements. Stallholders should not start selling until the official Carnival opening at 11am. Stall fees may be paid in advance (cheques payable to Wallingford Carnival, or by electronic transfer to Wallingford Carnival Account 60-22-19 67145663), otherwise they will be collected during the afternoon. All stallholders will be notified of their stall location prior to Carnival Day. On Carnival Day, a chart showing all stall locations will be available outside the Town Information Centre. Dennis Jackson, Stall Co-ordinator, will be available to assist and advise stallholders.